We’ve got big plans for this rural new-build, on a large picturesque property previously home to a 1970s Viceroy cabin. Our clients, a couple with two grown-up sons, had lived in a nearby town, and had dreams of retiring to the countryside. Last year, they decided to try their luck and look for property nearby. Instead of investing in the hugely expensive cost of repairing the existing home, they decided to rip it all down and start fresh. Besides, the old house had its back turned to the gorgeous south-facing river! With a new start, they would be able to grow old together in a customized house perfect for them and perfect for the property. 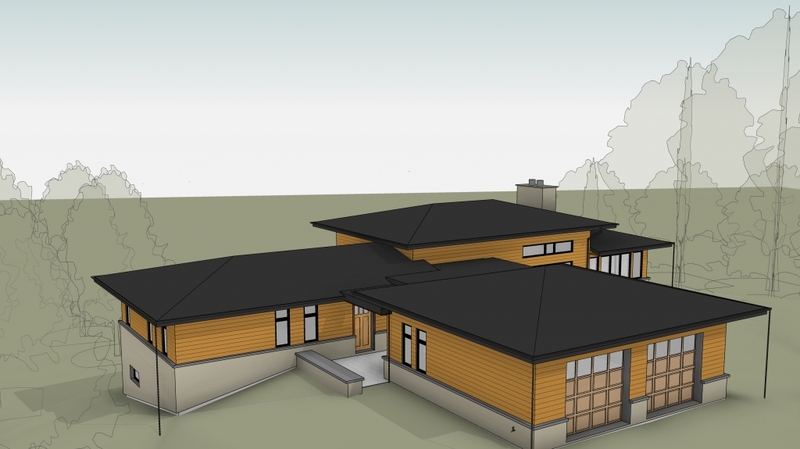 They chose Solares as their architect and we got started on the design. 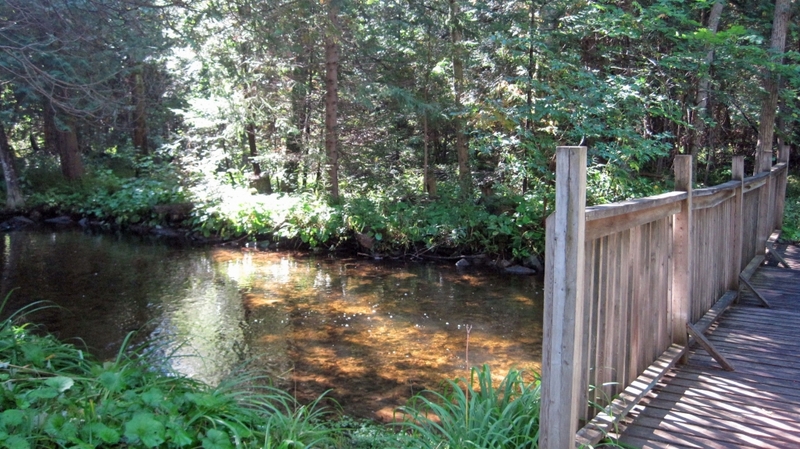 The property is great for biking, hiking, and relaxing outdoors, all of which our clients do often. As a COO and a stay-at-home mom, the couple spend their free time traveling, visiting with their two children and their families, and lounging either inside watching TV and movies, or outdoors reading and relaxing. The wife is an avid cook and cookbook-collector. With over 2000 cookbooks in her collection, kitchen storage space is critical! Tons is needed to store her cookbooks for easy access, for regular weeknight and Sunday-morning perusal. Their love of travel also means their home must be able to handle long periods of time without any upkeep, when the family is away on long, far-flung trips, something they are looking forward to doing much more of come retirement. The new building will be organic – as Frank Lloyd Wright would’ve wanted – and integrated into the surrounding landscape. 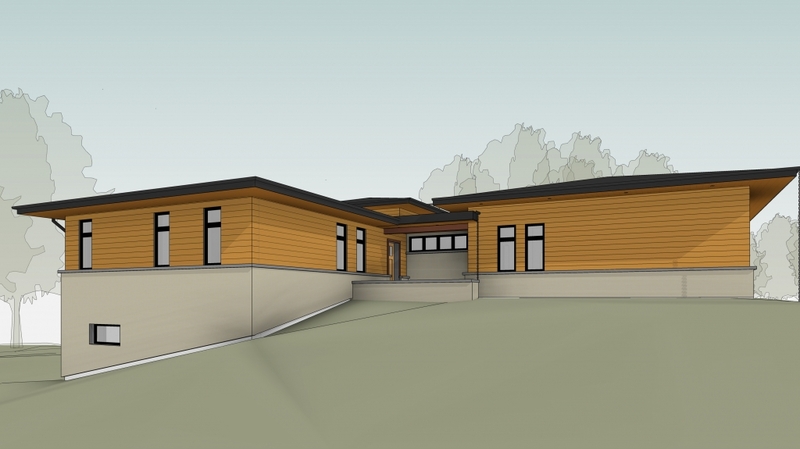 As a bungalow with a finished walk-out basement, it will be 2000 sq.ft. per floor. When I said we had BIG plans, I wasn’t kidding! Next on the docket for this project is finalizing the design. 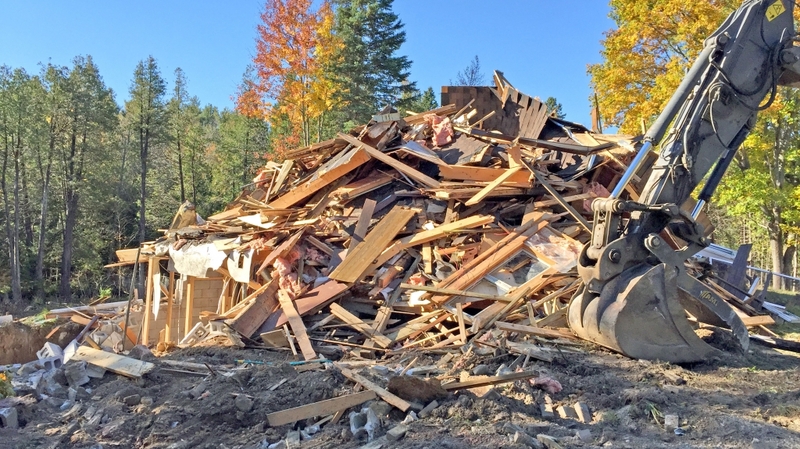 Then, we’re happily knocking down that big old cabin and building a house that our clients love. Stay posted! It’s been a little while since we introduced this beautiful new build, sitting along a tributary of the Credit River and home to an active couple nearing retirement. The home that previously stood on the lot was impressive, albeit dated and oddly oriented. The 1970’s Viceroy Cabin was suffering from mould and structural damage, and stood facing away from the lovely river that snakes by the property. Our clients decided to throw in the towel on the whole building and start fresh, calling on us to build a new 2000 sq.ft. 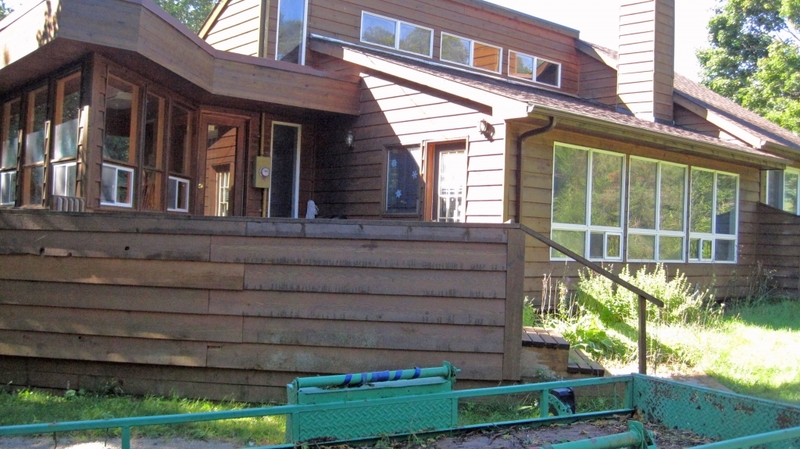 bungalow with a walk-out basement on the south-facing river side. 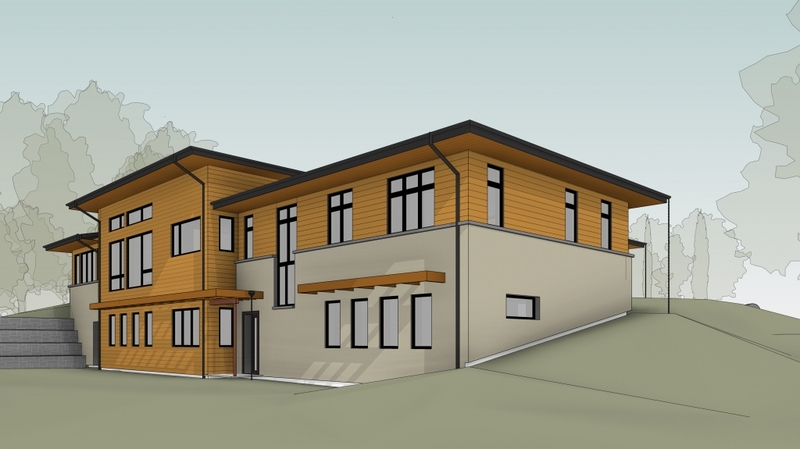 This spacious home will have everything our clients will need and more: the first floor will be home to the couple, and the basement will acts as a separate 2 bedroom suite for their oldest son and his family. The home’s design is fresh, impressive, and unique to our clients’ needs. Let’s take a look at the floor plan! Upstairs, a double garage connects to a mud room adjacent to the front entry. The master bedroom sits at the far east corner, with windows facing south and east. An ensuite bathroom and large walk-in closet complete the dream bedroom. Stairs to the basement divide the home’s private bedroom from the more public areas. The stairwell is designed with a tall window that perfectly frames the river’s picturesque footbridge seen from the property. A small window seat on the landing is the perfect place to curl up with a book on a rainy day. Beyond the stairs, a hallway opens up to the huge open concept Great Room. The kitchen (deemed one of the most important rooms in the house) has three zones: the cooktop with counters on each side, the island for food prep and quick meals and the sink area for easy clean up. A huge walk in pantry stands behind the kitchen, with lots more counter space and floor to ceiling shelving to house the wife’s extensive cookbook collection. 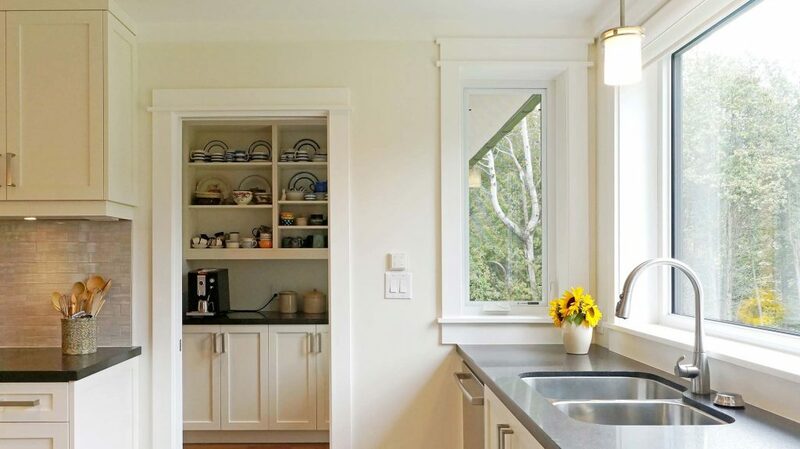 An extra special touch is the pantry’s window that looks towards the river. 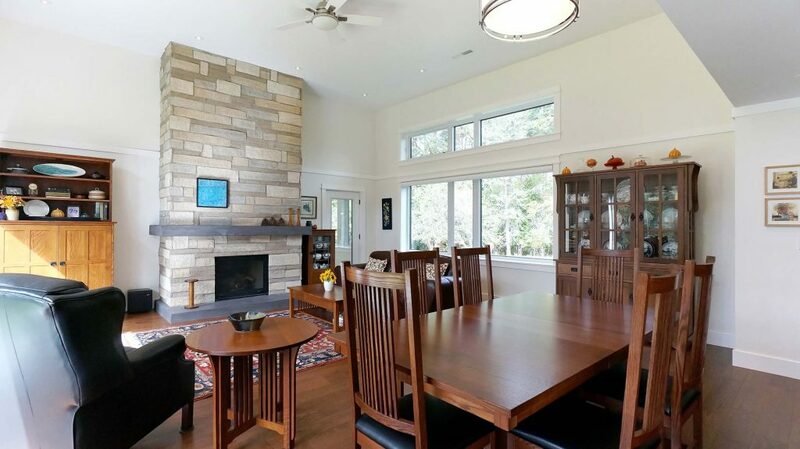 Past the kitchen sits the dining and living room with a near 14’ ceiling, huge windows on the south and north and a central stone-clad fireplace on the west end wall. An office is tucked up into the north-east corner which will make working from home a breeze, if need be. Behind the fireplace, a large sun room sits on the western end of the home, with an extra eating and sitting area, for late night sights of the river and the setting sun. The sun room is also home to a wood stove for cool evenings. The basement has an entrance from both the first floor and a private entrance from the outdoors, so the son and his family can have their privacy when needed. The basement has three large private rooms (to be made into bedrooms, baby’s rooms, offices, etc. 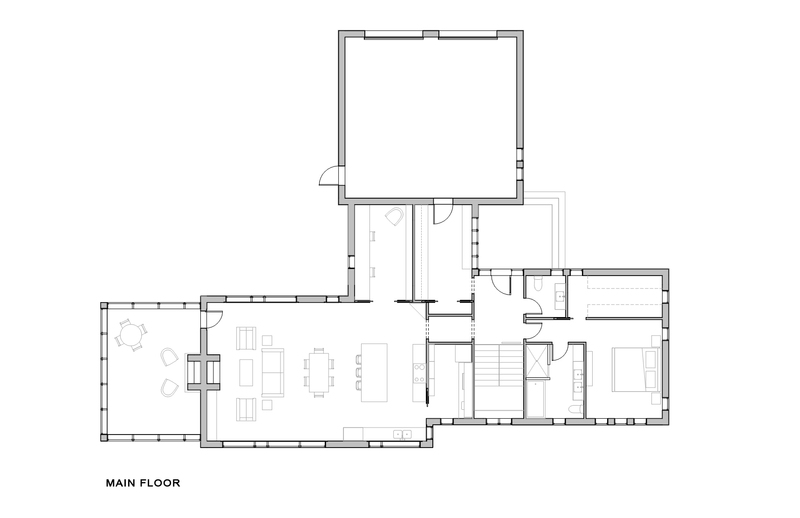 ), a bathroom, and a large living area. The home’s aesthetic will be clean, warm, and tranquil. Using Frank Lloyd Wright’s organic and Usonian architecture of the 1920s and 30s as inspiration, the home’s materials will be carefully chosen to reflect the landscape’s palette. Inside, the home will be modern and dramatic, with differing ceiling heights, delicate crown moulding, and our clients’ hand-crafted mission furniture. Next comes demolishing the old home and constructing the new one. We can’t wait to see this rural home take shape! 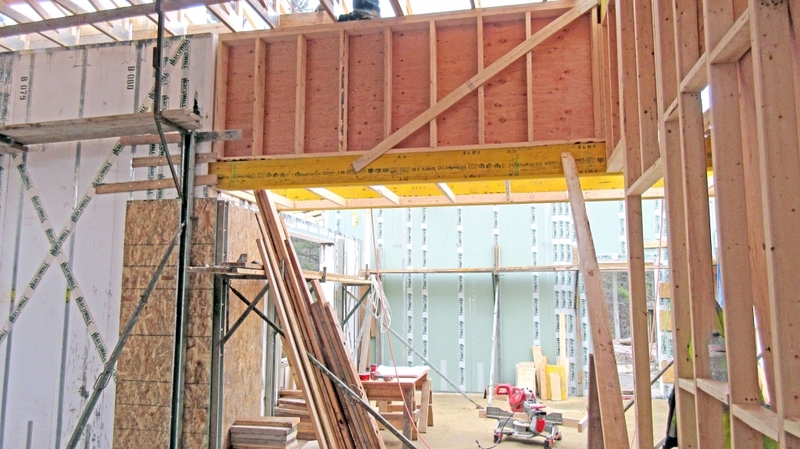 Beginning construction on a new building is a bit more work than a simple reno, or even a large-scale gut renovation. In a new build, the property must be prepped, the prior structure (if there is one) totally demolished, and the footings cast and the foundations poured. These are the very first forays into creating and assembling the home. Here is where the house finally starts to take shape! Starting construction on Credit River was especially demanding. The first step, prepping the property and removing the existing structure was a huge undertaking, as the existing structure, an old Viceroy-style cabin, was such a huge building! 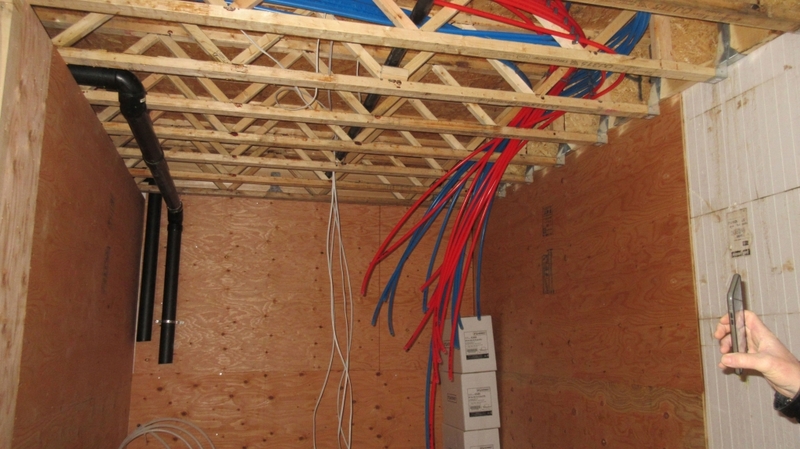 At 3,000 sq.ft, the structure was suffering from mould and structural damage and had to be completely removed. 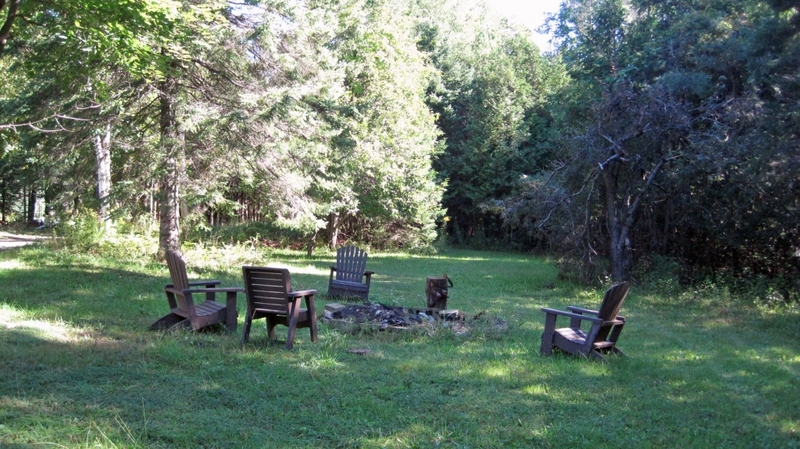 Besides, the house’s location on the property, facing away from the river, wasn’t ideal either. So the demolition was already a huge undertaking, even before building began! But our very first step, before we could even begin the removal of the existing structure, was erecting an erosion control barrier to prevent any run off, silt, garbage or debris from ending up in the beautiful river running alongside the property. 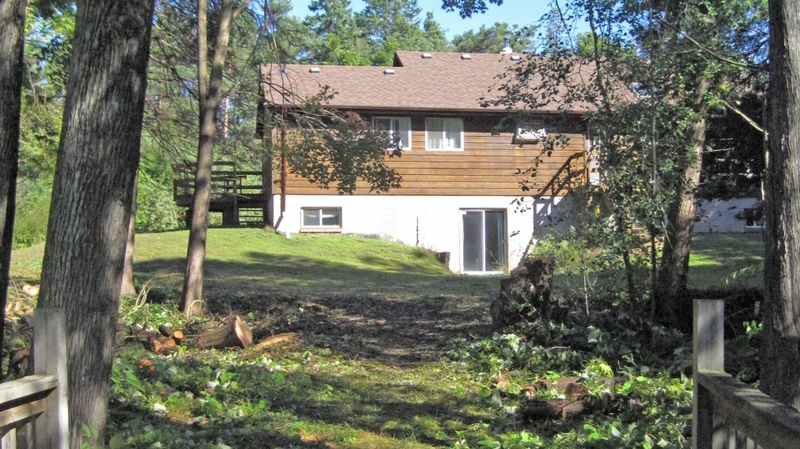 After we ensured we would not leave behind any debris in the river or on the property, we began to clear away the existing building, leaving us with a blank slate to begin construction. 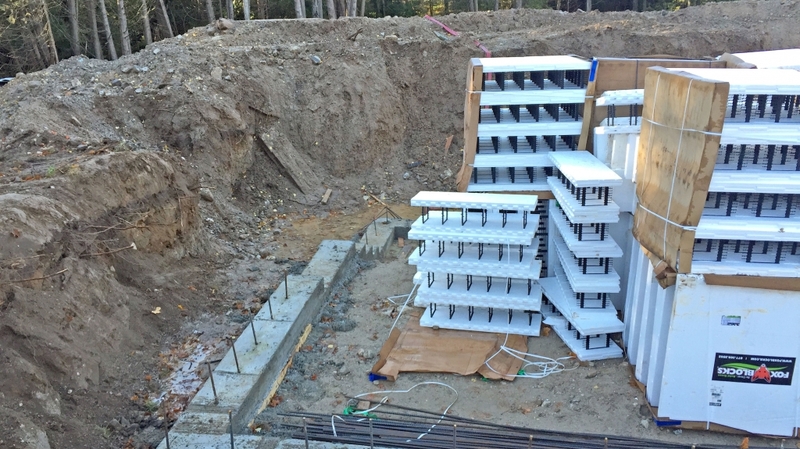 First was putting down our concrete footings, then our foundation of ICF (Insulated Concrete Form) blocks. On the foundation, we then erected a Hercuwall Frame, a composite concrete and steel structure that does double-duty as insulation and comes built in with its own vapour and air barrier. 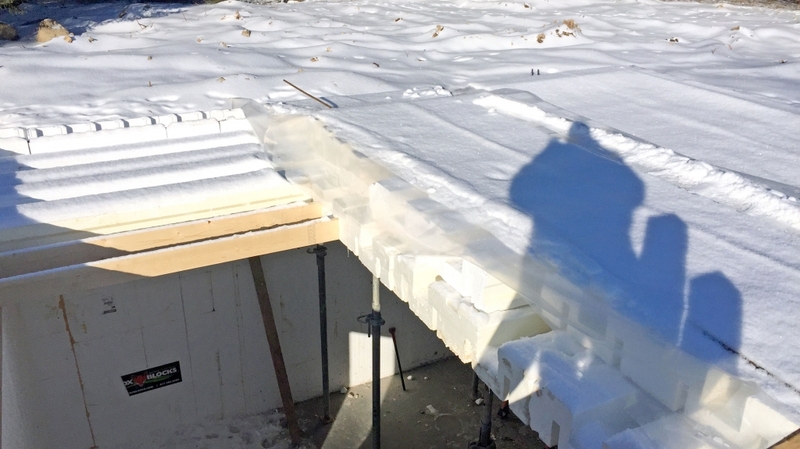 Hercuwall, an innovative new product by HercuTech, is both less environmentally damaging and easier and quicker to install than using ICF for an entire structure. Don’t get us wrong – we love ICF for its strength, durability, and energy-saving thermal mass and high thermal resistance. As well, ICF is extremely useful for its sound-absorption and fire resistance, plus many ICF walls are also made with many recycled materials. 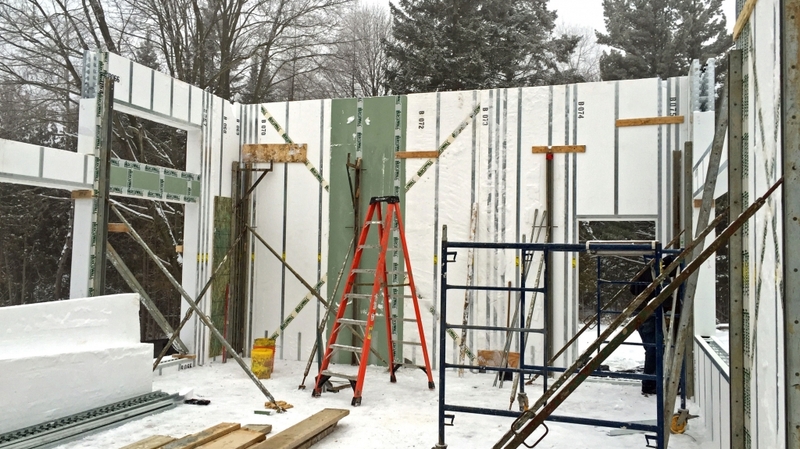 However, though ICF has some really great attributes, there are also factors to keep in mind when building with it – most importantly the high amount of concrete it uses, whose production can be environmentally damaging and contributes to greenhouse gas emissions. We think it’s always important to keep in mind both the positive and negative aspects of all building materials, even our favourite, environmentally conscious ones. What makes Hercuwall different from ICF (as well as any other building structure) is it is a single product that does many different jobs. Specifically, it is a building system made of composite concrete, foam, and steel, which arrives on location in a series of custom-built panels sized to match the individual project’s architectural plans. The structure uses less than half the amount of concrete that ICF does, making it even more environmentally efficient than ICF, and it uses no wood or timber, which helps reduce demand on timber resources and lowers its own embodied energy. Hercuwall also works as the structure’s insulation, water barrier, vapour barrier, AND window and door casings and sills. 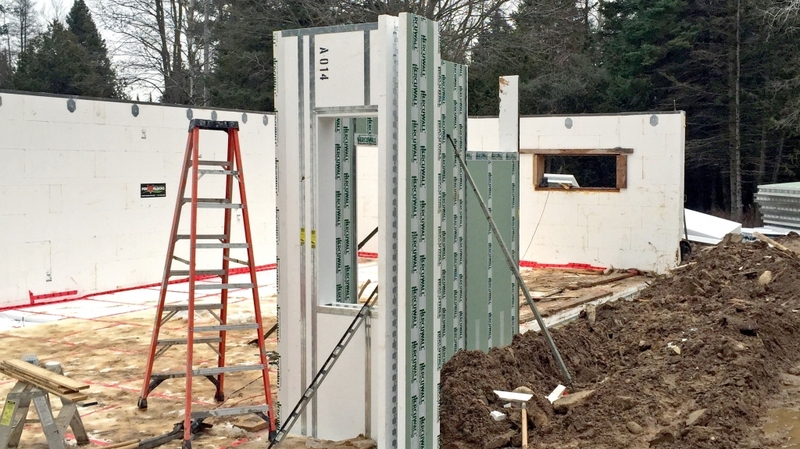 Comparing Hercuwall to ICFs, Hercuwall’s r-value is higher (R33 as opposed to ICF’s R24), even though Hercuwall is thinner by 2” (standing 9” wide instead of ICF’s 11”). Another bonus of Hercuwall is its easy set-up. 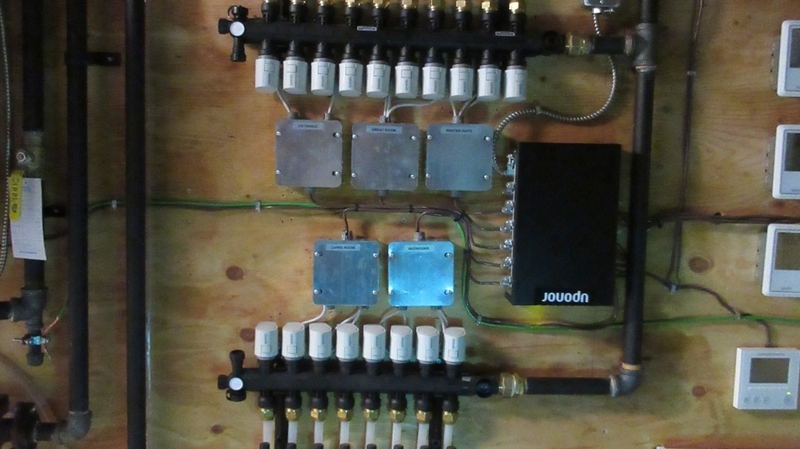 Because the panels are custom made to each project’s plans, the installation is simple, fast, and straightforward, requiring no special skills or certifications. 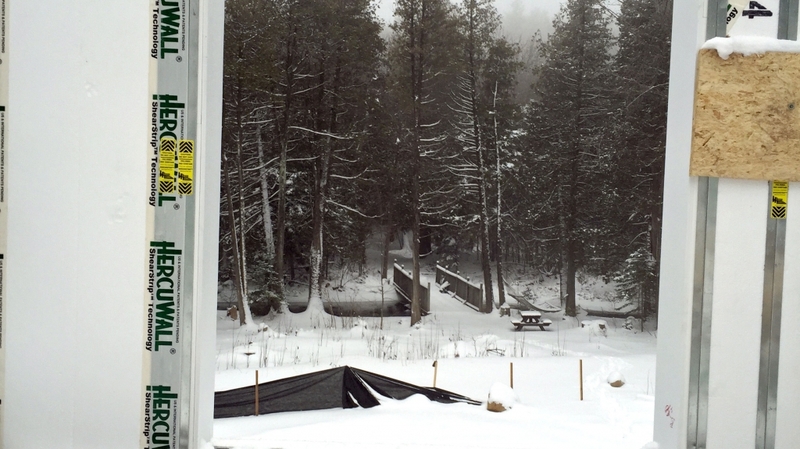 Credit River’s General Contractor, Chris Johnson of ProICF estimated our installation time as 60% faster than a typical ICF installation of the same project. Hercuwall’s website boasts near superhuman speed – , that with a crew of five people, the walls of a 2,400 square foot house can be installed in 2 and a half hours, with the concrete placed in 2 more. This may be exaggeration, or at very least an incredible “best-case” scenario – after all, it’s on their company’s website for a reason! 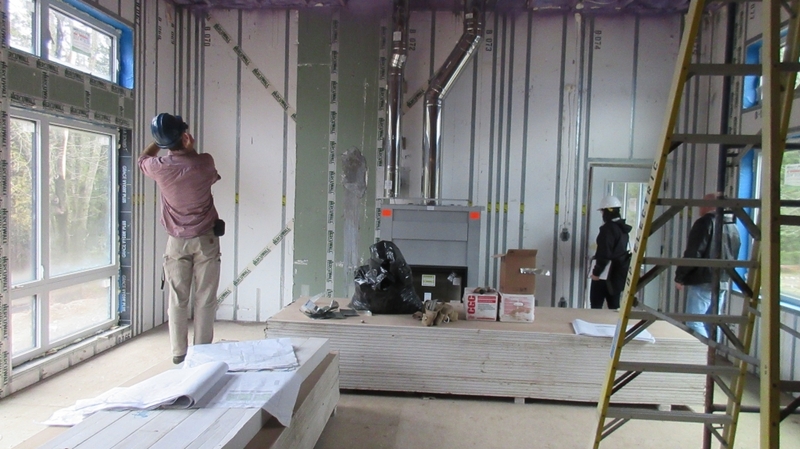 In our experience, the installation, though definitely not super-speed, was still much faster than ICF installation. It was particularly satisfying to erect our Hercuwall structure and try out this innovative material. In fact, the product is so cutting-edge that we are actually the very first to use it in Canada. That makes Credit River the first Canadian project ever to be built using Hercuwall! And we assure you it definitely won’t be the last. 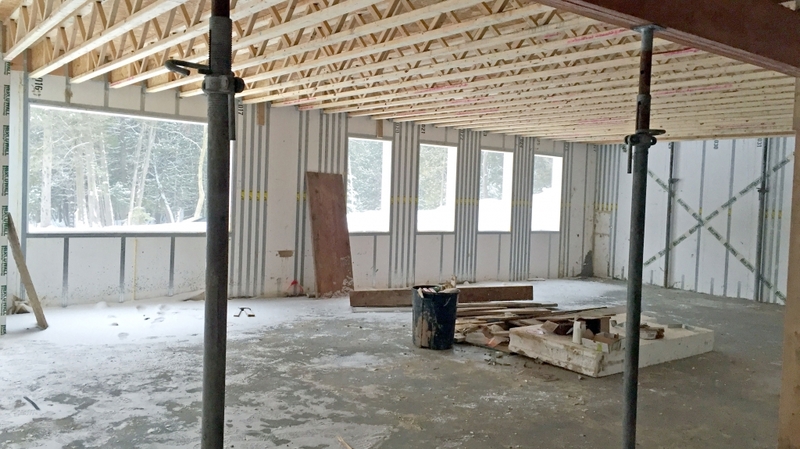 On either end of our Hercuwall structure, we opted for engineered floor trusses and roof trusses, instead of the conventional choice of floor and roof joists. The difference between the two lie in their shape. Joists are horizontal planks supported by walls or beams at each end: dimension lumber, like 2x10s or engineered joists like I-joists. The longer the joist, the further the span, so the deeper the planks must be in order to support the weight of the floor and everything on it. Trusses are more 3-dimensional than joists, and are assembled with larger pieces of lumber. They are similar to roof joists, except that both the top and bottom chords lie flat, parallel to each other. Trusses have two main advantages over joists: firstly, they can span longer that joists with limited depth. Secondly, the spaces between the members are useful for running services like HVAC ducting and plumbing drains, further saving space. We wanted to keep our house’s height down, to retain the low-prairie style aesthetic, and by choosing trusses instead of joists, we managed to cut out almost 10 inches of depth in the home’s floor. Awesome! We also used trusses for our roof’s structure. Yet again, we wanted to retain a low-lying structure that hugged the landscape, and roof trusses allowed for plenty of insulation within the spaces. 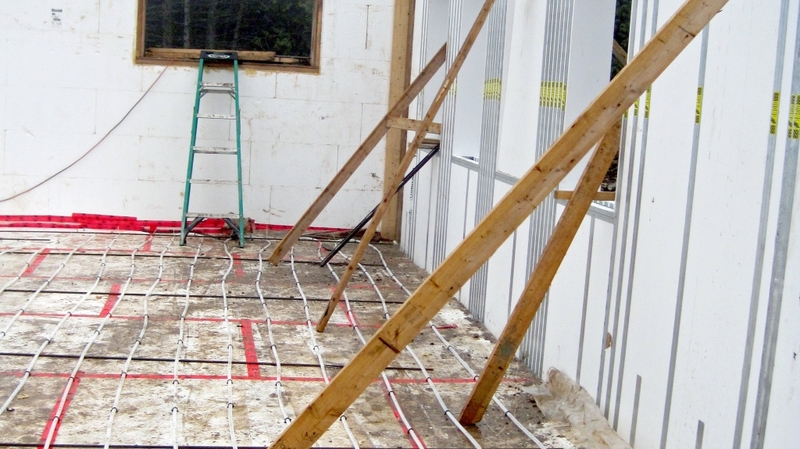 Finally, we finished our flooring by installing in-floor heating pipes, and finishing with a poured-in concrete screed. And with that, Credit River’s skeleton was standing on its own. 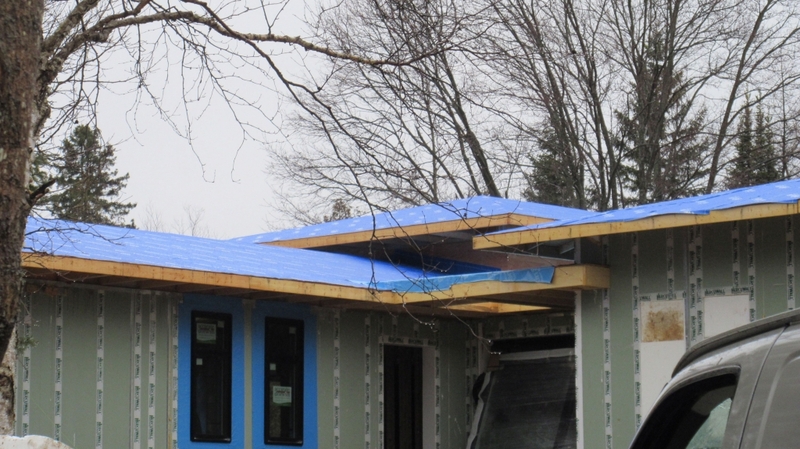 Next, I’ll update you on Credit River’s envelope: We’ll go over insulation, doors, windows, and roof and wall cladding. 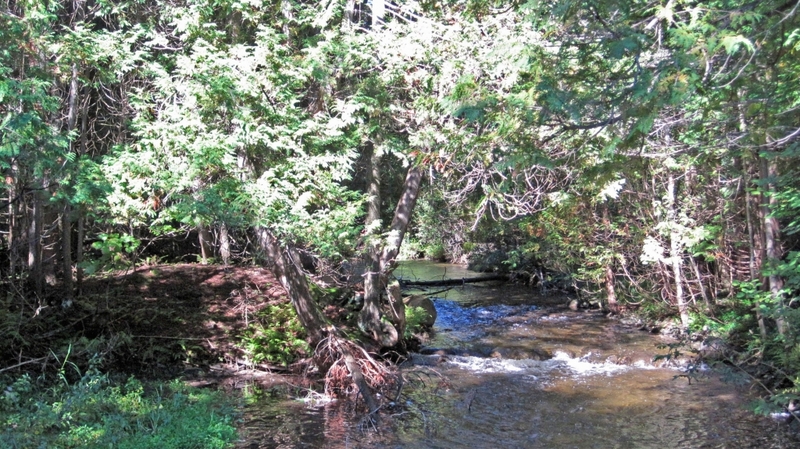 A lot has been done since we last spoke about our lovely Credit River Project! Construction of the house’s shell was swift and efficient, thanks to our building team and the structure’s innovative materials. 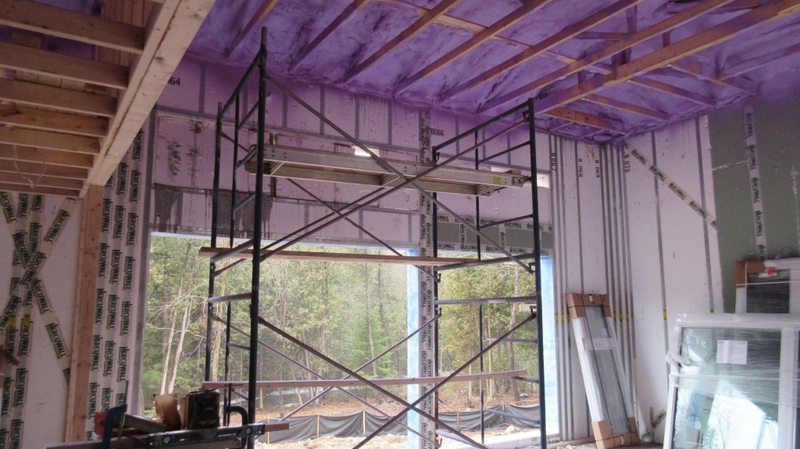 The building has really taken shape, and it’s not only beautiful: it’s airtight and well insulated. 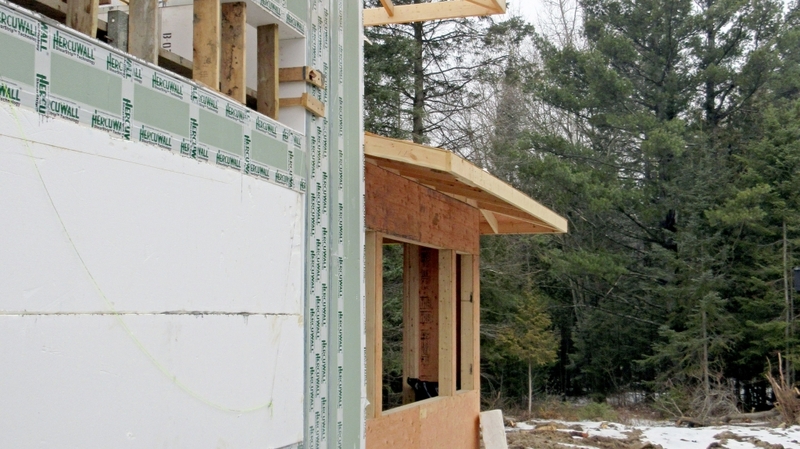 Today we’ll be talking about the home’s envelope, which includes insulation, doors, windows, and roof and wall cladding. If you remember, our last post about Credit River talked about the home’s construction and structure. 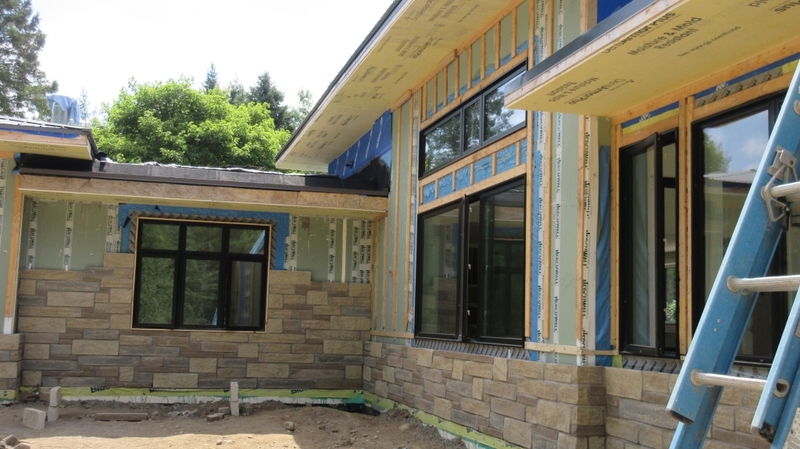 The picturesque Frank Lloyd Wright inspired home uses the innovative Hercuwall system. Normally, a building’s structure and envelope are composed of several different materials, all doing their specific and independent jobs. But what makes Hercuwall so unique is that it is one single product that acts as the structure, insulation, water, air and vapour barrier, and window and door bucks. Plus, it arrives on site in custom panels that are specifically sized to match the house’s design, which makes installation a breeze. After the Hercuwall structure was erected, all we had to do to ensure air tightness was to tape the joints of the wall sections with a tape specially manufactured for Hercuwall, applied on the exterior of the joints. 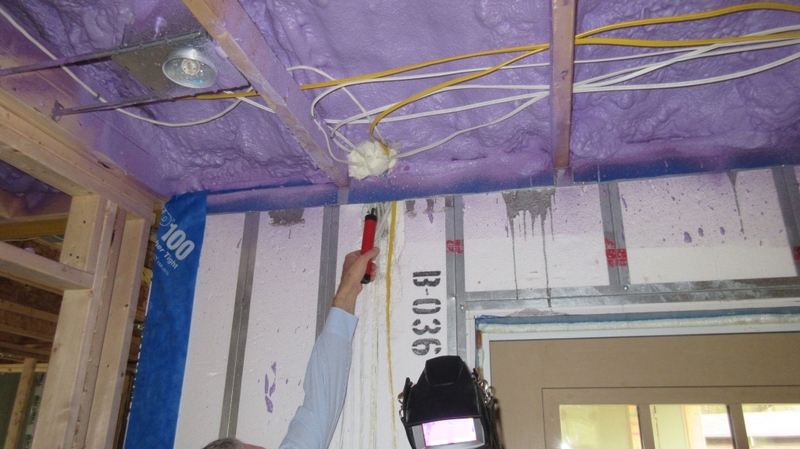 After the walls were sealed, we used the tape to seal the windows to the walls, and the walls to the roof. Our roof is composed of a few different components. 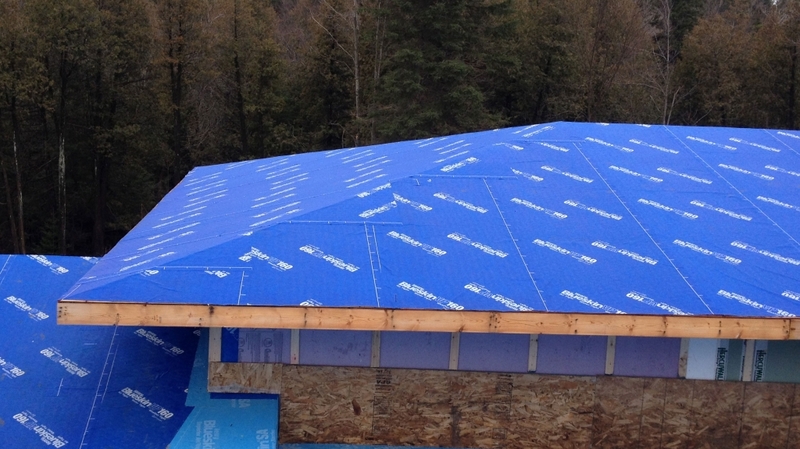 For insulation, we applied spray foam the underside of the roof’s sheathing, which works triple-duty as insulation, air barrier and vapour barrier. The roof’s exterior is sheet steel affixed onto strapping, which promotes ventilation behind the cladding. 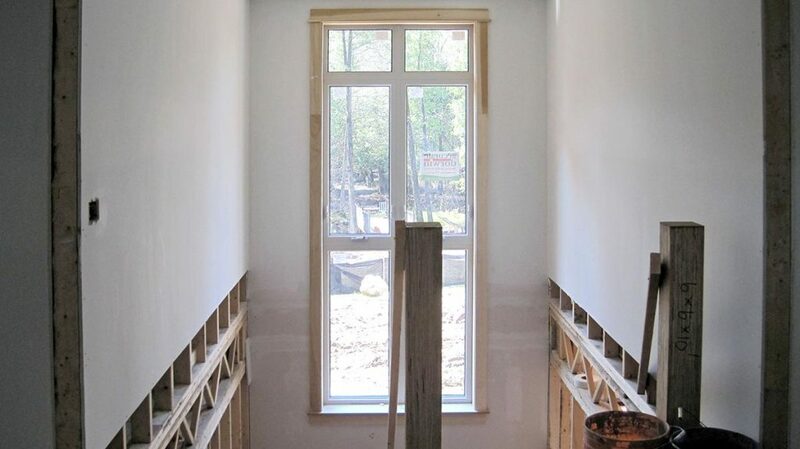 Then we installed our windows, from a company based out of Winnipeg called Accurate Dorwin. We’ve used Accurate Dorwin products before with excellent results. Their windows are high quality, super durable, triple glazed, fiberglass framed… we could go on! The home’s exterior is just as lovely as the surrounding property, with warm, inviting colours and natural materials. The wall cladding is composed of a manufactured stone base in beige, cream, and grey, made by a Canadian company called Arriscraft. This stone cladding wraps around the structure like a skirt, around the building’s base. Above the stone base sits factory finished wood siding, by a Canadian company called Maibec. The caramel-coloured wood siding paired with the muted stone cladding creates a striking aesthetic that harkens back to Frank Lloyd Wright’s Usonian houses of the mid 1900s, which are known for their tranquil beauty, open floor plans, and minimal upper levels or basements. They also typically used materials native to the landscape, and the interiors maintained a strong visual connection to the outdoors. We ensured Credit River’s exterior was just as beautiful as its interiors, something Frank Lloyd Wright would have been proud of. The house is well sealed and coming along smoothly! 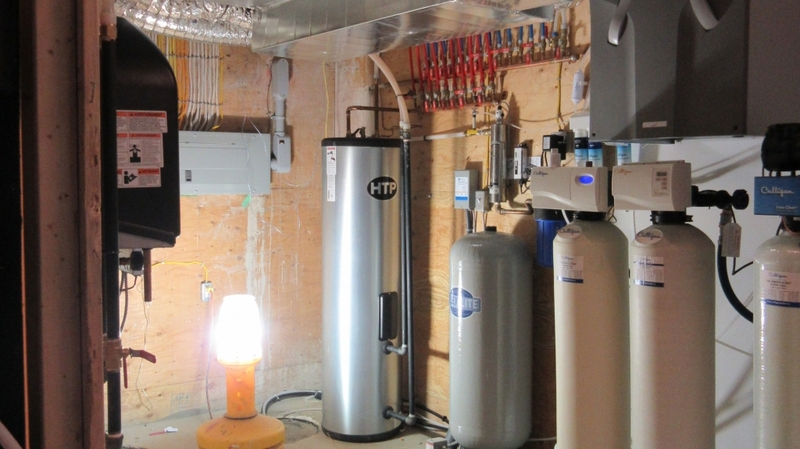 Next time we talk about Credit River, we’ll be talking its high-efficiency systems. The elegant Credit River Valley House has been equipped with equally elegant, high quality systems! The home has the graceful design of a luxurious, mid-century Craftsman home, but the house’s bones and building systems are light years ahead. The home’s warmth comes from two key elements: a gas boiler and a wood-burning fireplace. The gas boiler by HTP is fuelled by a large propane tank and powers the in-floor heating pipes, which are set into a 1.5 inch screed topping laid on top of the floor. A screed topping is quite different than a concrete floor, though they’re made of very similar materials. Concrete is made up of cement, large and small aggregate, and water. The cement bonds together with the small and large aggregate – coarse particulate materials used in construction like sand, gravel, crushed stone, and slag – to create a very durable, strong, and heavy building material. Screed is similar to concrete in heft and composition, yet instead of cement and small and large aggregate, screed is only a mixture of cement and fine sand. The lack of large bonding aggregate makes screed relatively easy to crush, making it much more vulnerable to damage than concrete. Because of this vulnerability, it has to be covered by flooring — it can’t stand alone like a polished concrete floor can. However just like concrete, a huge advantage to screed is that it acts as an effective thermal mass. It heats up slowly and consistently, and maintains its temperatures very well, making it the perfect material to surround in-floor heating pipes. For additional ambience and warmth, the living room’s wood burning fireplace helps offset the demand on the in-floor heating system. The wood stove in the screened-in porch/sun room provides added cozy warmth as well. As for cooling, the house has a forced-air system, powered by an energy efficient heat pump and equipped with its own ductwork, which disperses cool air uniformly throughout the house. 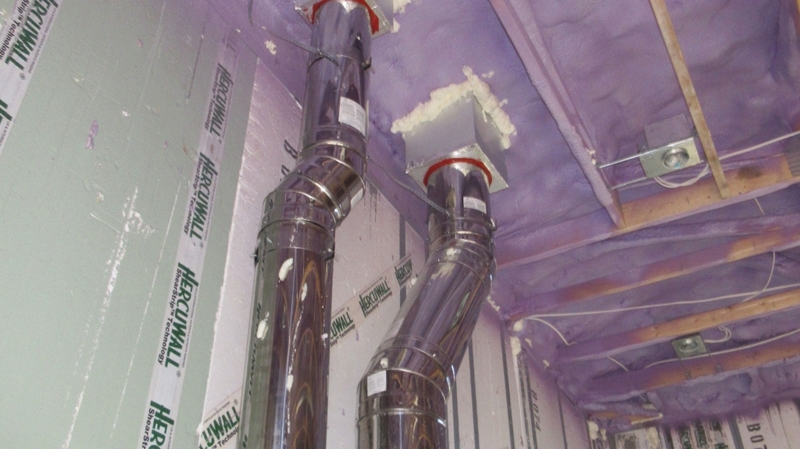 The HRV (Heat Recovery Ventilator) system, also with its own separate ductwork, is from Zehnder. We’ve always wanted to try out Zehnder’s wares, but previously our projects’ budgets haven’t allowed for their innovative yet costly products. We’re excited to finally be able to use one of their amazing and efficient ERV systems! We’ll be reporting back on our experience with it once it’s fully up and running. Finally, the house has been roughed in for solar panels, making for an easy installation process when the time comes. The entire roof has been made solar panel-ready, specifically the south and east facing parts of the roof, which get ample amounts of sun. This house has been a pleasure to design, and it’s so heartening to see it coming together so easily! Next time we talk about this project, we’ll be discussing the home’s beautiful and serene interiors. 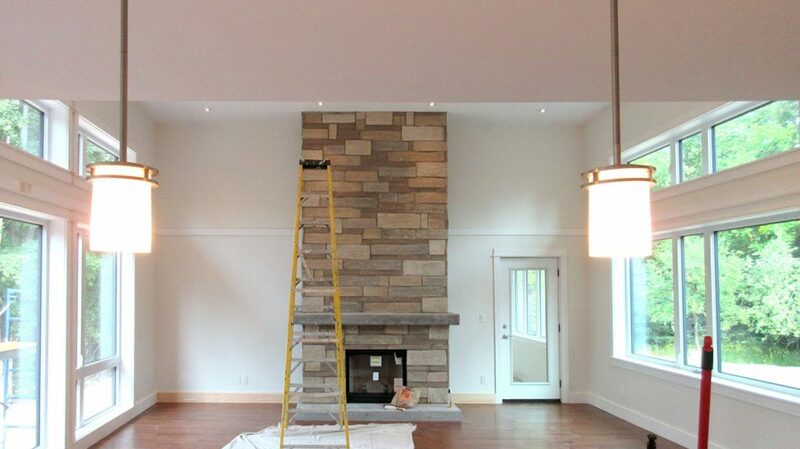 Welcome to the warm white interiors of Credit River Valley House! The overall feeling in this home is a country interior. It’s more white and bright than the Frank Lloyd Wright-inspired exterior would suggest, and yet it’s in keeping with the desire to connect the interior experience with the beautiful views outside. Every room looks out to the surrounding forest, including an exceptionally serene view of the Credit River from the Great Room, with its one and a half-height ceiling and large picture windows. Warm wood floors are offset by white trim and casings, and an earthy stone fireplace blends easily with the surrounding nature. The clean interiors also help to showcase the couple's collection of mission-style furniture through the house. 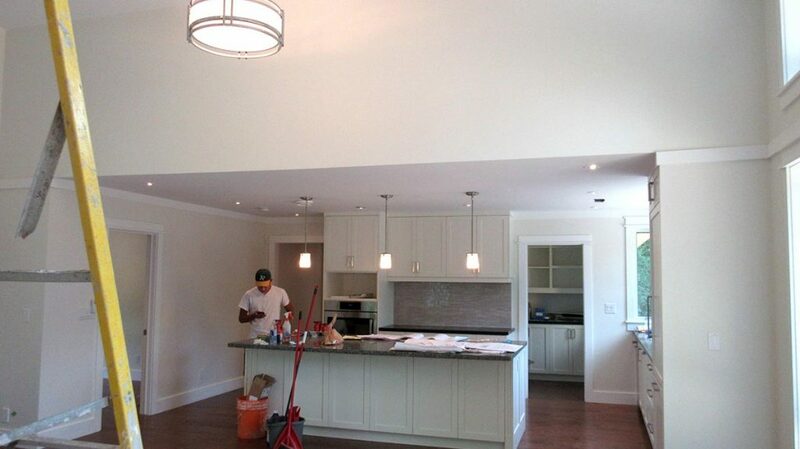 The cabinetry is custom-made by a local fabricator, and are all white with a grey quartz countertop in the kitchen. Bathrooms are white with chrome hardware detailing. The stone tile of the front walkway is continued inside the interior entranceway, further emphasizing the important relationship between inside and outside in this country home. We are so proud of this project, and thrilled to finally show it off! 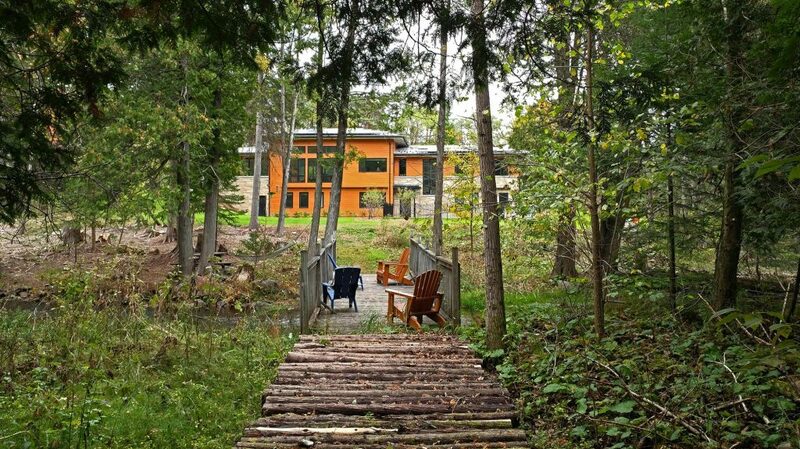 Our clients are very happy in their new home, with its clean, bright interior and expansive views of the surrounding forest and the Credit River. It’s the perfect home for them, their family, and their gorgeous collection of mission-period furniture. Our Elyse Snyder did a great job with this house, taking our clients’ vision and helping to shape it into a home they will be happy in for years to come. 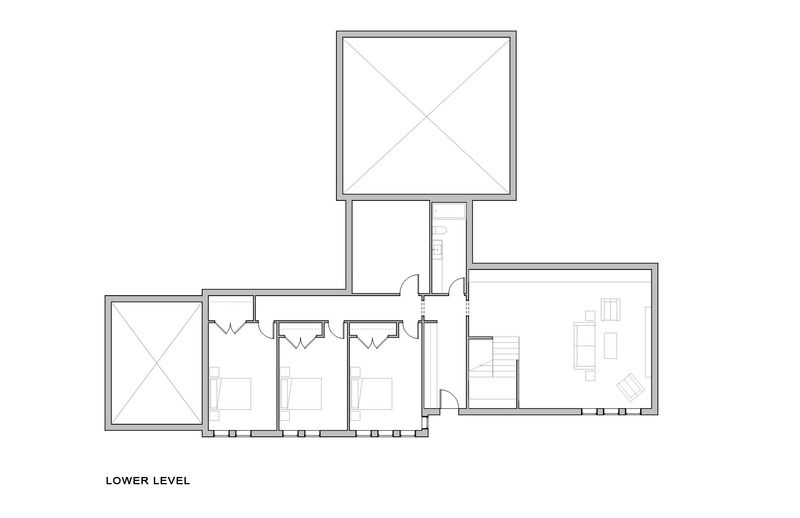 The original idea of a Frank Lloyd Wright-inspired home is felt as you move through the house, with a feeling of compression and expansion in the transition moments between spaces: a low entrance opens to a spacious entrance stairway, and compressed hallways open to expanded living spaces. Well done, Elyse! Click the link below to see all the final photos!